Dr. Edwin Cook is a board certified optometrist licensed to practice full-scope optometry, including the treatment and management of glaucoma (TPA/TLG). He received his Doctor of Optometry degree from Western University of Health Sciences, College of Optometry. Dr. Cook graduated with honors and was awarded "Outstanding Student Clinician of the Year" for his graduating class. He dedicated much of his time during school to providing volunteer eye care with groups such Lion's Club International and California Care Force. During his clinical rotations he provided care for many veterans and active duty persons at the Veteran's Hospitals in Florida, Colorado, and Madigan Army Hospital at Fort Lewis/McChord in Tacoma, Washington. 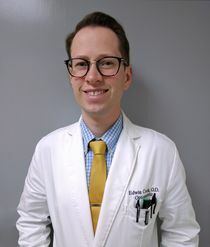 Before entering optometry school, Dr. Cook graduated from the University of California, San Diego with a bachelor's degree in Pharmacological Chemistry. Currently, he lives with his wife, Amy, and their two cats in Pasadena where they enjoy being adventurous eaters and hiking the surrounding hills.